LIFE Magazine and LOOK Magazine would both debut in the mid 1930’s. Magazines into the 1930’s, led by Saturday Evening Post, presented attractive covers with some artwork inside highlighting the text which formed the basic information being sold to the public. LIFE Magazine and LOOK Magazine would bring photojournalism to the public of the day and leave a legacy of pages of history for us to devour inside every old issue today. Born of a similar time they would both die in the same period as well (though LIFE Magazine was quickly resurrected). Their histories are an interesting and in the beginning an intersecting story. popularizing photojournalism in America, and as such are the two most highly collected today. The magazines were popular enough in their time to be saved by many people–Grandma may even have a stack in her basement to get you started. This makes them common enough that most collectors are able to target a complete run. Henry R. Luce (1898-1967) founded Time Inc. with Yale classmate Briton Hadden (1898-1929) in 1922 after hatching the idea in officer’s training during World War I. The first issue of TIME Magazine was dated March 3, 1923 (the history of TIME is covered in detail elsewhere on this site). Luce and Hadden launched other magazines, such as the Saturday Review of Literature, but it was not until after Hadden’s death that Time Inc. would launch their next major publication, Fortune, a business magazine, in February 1930. As the 1930’s progressed the idea of a picture magazine became forefront in Luce’s mind (though there are varying opinions of how it got there). LIFE Magazine had been a humor magazine founded by Harvard alumni in 1883. This explains those pre-1936 issues of LIFE that you sometime see for sale–they have nothing to do with Luce or Time Inc. However by the mid-1930’s circulation of LIFE had fallen to about 70,000 and Luce acquired the name for $92,000. LIFE Magazine as we are mostly familiar with it debuted with Volume 1, Number 1 dated November 23, 1936. Margaret Bourke-White, Alfred Eisenstaedt, Peter Stackpole, and Thomas McAvoy in the masthead and they would soon be joined by Carl Mydans and a host of others . Bourke-White had the honor of the cover photo, the Fort Peck Dam, on that inaugural issue. Gardner “Mike” Cowles, Jr. had no publishing experience, but he did have an idea. That idea was for his own picture magazine called, LOOK, which he would develop a dummy copy of and solicit the opinion of Henry R. Luce about. Luce took a look at Cowles project and then showed him his own mock-up of LIFE. 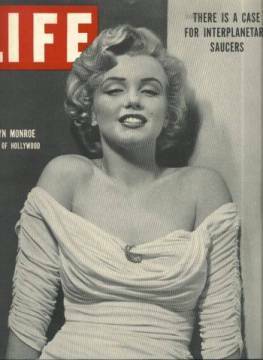 The men decided that the magazines wouldn’t pose a direct threat to one another with LIFE Magazine being a news-centered weekly intended for a better educated audience than the planned monthly LOOK Magazine which would cater more to the common interest through illustrated features. Luce even offered to invest $25,000 in the launching of LOOK. The first issue of LOOK Magazine hit newsstands soon after LIFE’s debut with an issue dated February 1937. It was so well-received that by April it went from being a monthly to a bi-weekly publication. Both magazines were early successes in terms of circulation. But LIFE was losing money from the beginning. With 80,000 subscribers in 1938, plus 1,000,000 single-copy newsstand sales at just 10 cents per issue, expenses were not being covered. In other words, the more issues that they sold the more money that they would lose. LIFE Magazine would push itself over the top through the controversy surrounding a film called “Birth of a Baby,” which had been banned in New York. LIFE published a five-page article including dozens of frames from the controversial film–this issue of the magazine was itself banned in 33 U.S. cities in what turned out to be a huge publicity boon for Luce. Meanwhile LOOK was suffering it’s own problems in the late 1930’s. Circulation, which had topped 2 million in October 1938, had sharply declined by July 1939. LIFE had established itself as the leader in the picture magazine field as the first of its kind, plus it’s gains from the “Birth of a Baby” publicity. At the same time, in response to the success carved out by both LIFE and LOOK Magazines, several other picture magazines had launched, most notably Pic in 1937, and the competition took its toll on LOOK. After some deliberation, Mike Cowles hired himself the top circulation experts available and had his magazine on the way to profits within a year. In 1946 Cowles married Fleur Fenton who involved herself quite a bit with the magazine’s affairs as an associate editor. By 1948 circulation of LOOK Magazine topped 3 million. LIFE Magazine had established itself as the war magazine during World War II by offering serious coverage of events complete with trademark photos and even original artwork that they commissioned from top U.S. artists. From time to time they’d still show their lighter side with features such as the famous Veronica Lake article which trumpeted the troubles that a Peek-A-Boo hairstyle could cause while working in a factory. The photojournalism of LIFE and LOOK flourished in the fifties, but both were in steep decline by the late 1960’s. 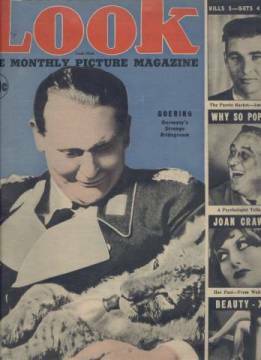 Cowles would view television as the major villain contributing to the demise of his LOOK Magazine. Founder of Time Inc. Henry R. Luce would die in 1967, which certainly couldn’t have helped LIFE’s fortune. By 1969 the issues were growing smaller and LIFE Magazine was again losing money. Competitor Saturday Evening Post would fold in February 1969 and LOOK was in a lot of trouble itself before finally calling it quits with their last issue dated October 19, 1971. LIFE Magazine would hold on for just over one more year, ceasing publication themselves with the December 23, 1972 issue, their special double-issue Year in Pictures edition. LIFE Magazine was back as soon as 1973 publishing two special issues each year from 1973 through 1977 before returning as a monthly in 1978, but for collectors it’s that grand initial run from 1936-1972 which interests us. LIFE and LOOK Magazine are affordable collectibles, with even key issues usually running no more than $100 in nice shape and most available for just $4-$6 in average condition. The covers as well as the lavishly illustrated contents assure that both magazines will be collected by others in the future as well. Kunhardt Jr., Philip B. Life the First Fifty Years, 1936-1986 . Time, Inc., 1986.